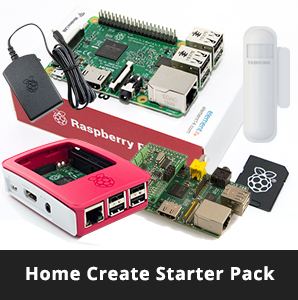 A great way to kick off your home automation project, building your own Home Controller. Once your ready to go, choose a home automation software system and start your build. There are many Home Automation controller software systems out there. We have written up some instructions to get you started using OpenHAB. Take a look in our forum under the Raspberry Pi section. *Note: The Aeon Z-Stick Z-Wave controller comes standard in this pack. We can also offer the RaZpberry Pi Daughter board or the ZME USB stick. Please order and email us to confirm if you want to swap for one of these options. *Note: Can swap the TKB Home 4 in 1 Sensor with the Aeon multi sensor if wish.